Five years ago, Jimmy Keeter, CPA, was concerned about what he saw after performing a worst-case scenario analysis on the trucking operations of Daylight Donut Flour Co. of Tulsa, Okla., which he serves as CFO. The company, which provides ingredients and equipment to licensed doughnut shop operators in 38 states and a few locations outside the United States, carried insurance, of course. But Keeter determined that a worst-case trucking catastrophe could exceed its coverage and bankrupt the company. Keeter’s concern about liability led to a decision by CEO John Bond and the company management team in 2008 to outsource trucking operations that had been managed by Daylight Donut since 1977. The move to provide long-term sustainability is a simple example of the finance-driven innovation CPA decision-makers crave, according to a survey released Tuesday. Nearly three-fourths (74%) of CPAs participating in the AICPA Business and Industry Economic Outlook Survey for the third quarter of 2013 said finance and accounting should play an important or extremely important role in organizations’ innovation efforts. But just 30% of respondents said finance and accounting contributes to innovation to a large or extremely large extent. Thirty-six percent said finance and accounting makes modest contributions to innovation. Nonetheless, the survey results show a desire from at least some CPAs for finance and accounting to have more of a role in innovation. Survey respondents viewed executive management and operations as the biggest functional contributors to innovation, ahead of finance and accounting. Q: To what extent does each of these functions contribute to innovation at your organization? Source: AICPA Business and Industry Economic Outlook Survey, 3Q 2013. Dennis Durkin, CPA, CFO of Philadelphia-based real estate multiple listing service provider TREND, said that unfortunately, finance sometimes is seen as an obstacle to innovation in organizations. Durkin encourages innovation and would like finance to play a larger role in generating and promoting new ideas at his company. But he said the technology used in IT and product management at TREND is so complex that it limits his input. He said he is fortunate to have personnel in those departments who can explain the technical aspects to him so that finance can help facilitate innovation. But he doesn’t have the technical knowledge to suggest new processes himself. Durkin has been considering updating the technology used for finance and accounting processes themselves in hopes of creating more efficiency and better controls. But he said his staff is performing well and is comfortable with the way things are done now and performs well. And Durkin said it’s difficult to assess whether a new system would deliver increased efficiency. Up until about 10 years ago, Durkin said, accountants would identify needs and then buy technology to fill those needs. Now, he said, technologies are being developed before accountants even identify needs. And accountants find themselves puzzling over technologies to figure out whether they could fill needs or solve problems that the accountants may not have even been aware of. Benjamin Harris, CPA, CGMA, president and CEO of communications and technology consulting firm BLH Technologies in Rockville, Md., said many accountants need more training to take full advantage of software and data analytics to find problems and inefficiencies that could be corrected. More emphasis on data analytics at the college level and training for working CPAs by organizations and industry groups could help bridge a knowledge gap that is hindering innovation by finance and accounting, Harris said. In addition, he said some accountants are too busy getting their reporting done to set aside time to analyze problems and find efficiencies. A CGMA report released in May described the role finance can play in fostering a creative atmosphere at organizations. But the Economic Outlook Survey showed that many organizations are lacking what might be called “drivers” for innovation. 17% have financial incentives for employees who innovate successfully. 15% distribute regular employee surveys that ask for innovative ideas. 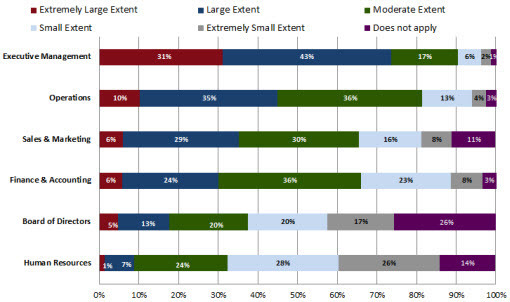 13% have a clearly defined risk appetite that sets the parameters for innovation. 10% use “stage-gate” processes that help early-stage innovations while limiting risk. 5% participate in “crowd sourcing” through software or social media. Forty-one percent of organizations reported using none of those tactics to drive innovation. Although formal organizational support for innovation may be lacking, some experts say this presents an opportunity for finance and accounting to take the lead. Chris Bragas, CPA, CGMA, president and CEO of New York-based Eastwest Marketing Group, said the finance function’s work with data on the back end of processes creates the ability to recognize opportunities to improve the processes. The key, Bragas said, is partnering with colleagues in other business units. 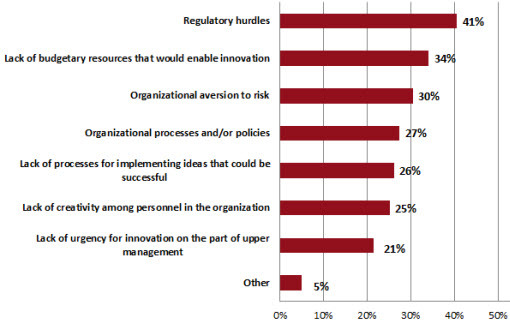 The top impediments to innovation at organizations include regulatory hurdles (41%), lack of budgetary resources (34%), and organizational aversion to risk (30%), according to the survey. Q: Which of the following factors are a significant impediment to innovation at your organization? Please check all that apply. Despite the hurdles and shortcomings, one expert sees the survey results as an encouraging sign. The fact that nearly three-fourths of CPAs consider finance and accounting to have an important role in innovation represents a positive shift, according to Joshua Azran, CPA/ABV/CFF, CGMA. A management consultant and partner/owner of CPA firm Azran Financial in California, Azran said that the results show a change in attitude from about 10 years ago, when, he said, some CPAs thought it was enough to implement an SAP or Oracle system to create reports and organizational dashboards for executives. 1. Be part of fostering a culture of innovation. “The best companies I’ve seen, of all sizes, really … include finance and accounting at the table, not just at the board meetings, but at the meetings when you’re trying to figure out how to do better for the company as a whole,” Azran said. 2. Leverage existing technology. “There are a ton of applications, plug-ins, technology resources, ways to leverage things, ways to reorganize your organization, and really become a sum of the parts,” Azran said. 3. Don’t be afraid of technology. Azran said people fear technology because they think it’s going to replace their jobs, but said he hasn’t seen that to be the case. “It definitely re-tasks people, and I won’t mince words about that. But in most all circumstances, [technology handles some tasks], and then those [finance] people go and add value or support in other ways,” Azran said. 4. Become an expert in a subject outside finance and accounting. “There’s not a hard-and-fast line between finance and accounting and IT, or finance and accounting and sales, or anything. And those people who I think realign themselves and identify those opportunities are going to bring significant value to their companies,” Azran said. 5. Take time to analyze the data and think innovatively. Azran said companies need to give finance and accounting professionals time to innovate outside of normal reporting, compliance, and budgeting activities. “We have to start pushing data. There has to be buy-in about that, absolutely, giving people the time to do the analysis, and … giving companies the opportunity to take advantage of that information,” Azran said. 6. Reexamine processes when installing new systems. “You’re not going to see the full value unless you go in with the perspective that we have to reexamine our processes and reevaluate. It’s something a healthy company should do anyway on a regular basis,” Azran said. At Daylight Donut, Keeter took a holistic look at the trucking operations and became convinced that a change needed to be made. He said the company previously did a good job—but not a great job—running its trucking services. The trucking company that Daylight Donut chose provided good service at a slightly higher price. But Keeter said the extra cost was worthwhile because it eliminated a huge liability and allowed Daylight Donut to focus more on its core operations. A second five-year contract with the trucking company, which began Sept. 1, is evidence that the finance-driven innovation was a success.